Recent studies and government reports continue to highlight what many Americans know by their wallets: Rising income differences, debt and stagnant real wages are among the biggest problems besetting the nation. That economic inequality is reflected in America's schools, right? Absolutely. But a study just out shows that the gap in school readiness between rich and poor children entering kindergarten closed significantly — by 10 to 16 percent — from 1998 to 2010. Some ethnic/racial achievement gaps declined as well. I spoke with the study's lead author, Sean Reardon, a professor of poverty and inequality in education at Stanford University. Your study's results are kind of surprising given the widening income inequality over the same period, no? Yeah, actually really quite surprising. Certainly it wasn't the finding we expected when we started the study. We thought because income inequality continued to grow and because achievement gaps had been growing for several decades, we thought we would just see that they had continued to grow, but the data say otherwise. Why do you think the gap has narrowed? More parents more engaged, doing more at the pre-K level across all incomes? Or are there other factors? I think the two most likely explanations are improvements in the quality of preschool available to low-income families and more engagement of families across the income distribution, but particularly low-income families, in sort of cognitively enriching activities with their kids. Give us some examples. Reading consistently to your child, taking them to museums, that kind of thing? Yeah. We looked at the data to sort of see what parents say they have been doing with their kids over the last year. In the 2010 cohort, parents say they're doing more reading to their kids, they have more books at home. They're taking them to zoos, libraries, museums, places like that more. Their kids are doing more, playing more with computer games that are designed to teach them literacy and early numeracy skills, shapes, colors, sounds, letters, stuff like that. All of those things together we know are likely to help kids get ready for kindergarten. What's interesting is the increase in those kinds of activities is more pronounced among low-income families over this 12-year period than it is among high-income families. That is interesting. How was school readiness defined in the study? 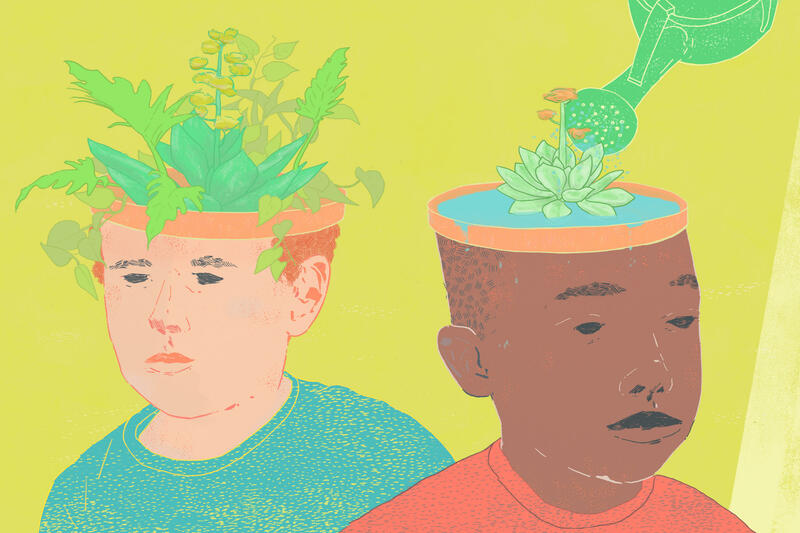 These are studies where, in 1998 and 2010, the National Center for Education Statistics sent trained early-childhood assessors out to 1,000 kindergartens around the country. In each kindergarten they sat down one on one with about 15 to 25 kindergarten students. And they asked them a structured set of questions to see if they could recognize letters, sound out words, count, recognize shapes, recognize colors and a variety of things like that. These were all sophisticated, kind of one-on-one assessments of kids: pre-literacy skills, pre-numeracy skills, as well as some of their behavioral skills. They asked the teachers to report on student's behavioral skills. It's a pretty sophisticated and quite intensive study of tens of thousands of kids. So it's good data. Well, so, isn't this study yet another indication of the importance and power of quality early-childhood education? I think a lot of research and a lot of evidence shows that focusing on early childhood is really important if we want to create equal opportunities for kids. I think these studies show that the emphasis over the last decade or two in early childhood that we've seen most in public policy, the expansion of preschool stuff, but also in kind of messaging to parents and public information campaigns about the importance of doing these kind of things with their kids, has really started to pay off. Your study covered 1998-2010. It would be interesting to compare a line graph of the readiness gap from '98 onward to a graph of early-childhood spending and investment over the same period. Your thoughts on that correlation, if there is one? If you look at the data on spending, public state spending on preschool has doubled over that period more or less. The rate of enrollment in state-funded public preschools has also doubled over that time period, so there's been a big increase in the number of kids that are going to preschool and the amount that we're spending on it. That corresponds with the same timing where we see this narrowing gap. Now, that might be because preschools are getting better as well as more kids going to them. What, if anything, do we know about what portion of the sites in the study that could be considered high-quality pre-K? At what sites did children get a big dose of early-childhood services? Because then you might be able to see if the gap closed even more in those sites, no? Right. We can't tell that from the data we used, but there are some other data from about 10 years ago where there were surveys done and people went out and observed preschools all around the county and measured their quality. A striking finding from those studies is that there's real variation in quality, and high-income communities tend to have public preschools — not just the private ones but the public ones — that are very high quality. Low-income and predominantly minority communities typically have much lower quality preschools. And that's a thing we've really got to address if we're going to continue to improve the quality of early-childhood opportunity for low-income kids. Yes, while the gap has narrowed significantly — 10 to 15 percent is significant — it still has a long way to go. Talk about that. Yeah, I mean, it's narrowed and that's great. But it's still huge. The low-income kids are coming in about six to nine months in readiness behind the high-income kids still. So that's a big difference, knowing how fast kids learn in kindergarten. If the rate continued at which it is now, it would still take something like 60 to 110 years, we calculated, for the gap to be eliminated. It's narrowing at a measurable rate. But it's not narrowing fast enough that it's going to reduce this to nothing in our lifetimes. The gap by race, the gaps between white and black, and white and Hispanic children, also declined over this period, according to this study, correct? That's right. The gap between white and Hispanic students declined about the same amount, roughly 14 to 15 percent. The gap between black and white students also declined roughly the same amount, though there's more uncertainty in the estimates there, so we can't say for sure how much it declined but it looks like it declined. That's good news because we're seeing both racial gaps and socioeconomic gaps declining over this time period. I'm just curious, why the uncertainty in the white-black data? Well, all these estimates have some margin of error around them. The change in the black-white gap is not quite big enough that the margin of error rules out the fact there's a possibility that it didn't change at all. The Hispanic-white gap looks like it's a little bit bigger, and that's just enough to sort of put its margin of error over the limit where we can say for sure that it really changed. It's one of those gray statistical areas that frustrate people like me. Big-picture question: In American education, per-pupil spending is used as a proxy for an almost absurd number of things: quality, adequacy, political commitment and more. [See our recent series School Money: The Cost of Opportunity.] It seems like a crude measure that can miss nuance, including teacher quality, oversight and teacher training especially at the pre-K level. Your thoughts on that. Certainly schools with more resources, on average, can hire more experienced teachers, better teachers; they can have better facilities and whatnot. But spending by itself is, as you say, a pretty crude proxy for quality. It's possible to have better and worse schools that are spending the same amount of money. While it's important that we make sure we spend enough to pay teachers enough to make the teaching profession attractive to the most skilled people, spending alone is probably not sufficient to make sure we have high-quality schools. Do you think your study might lend itself to a closer look at a kind of "who got what, and how much?" And digging deeper into how much the gap narrowed? Yeah, I think you could think of this study as a starting point. I mean, it certainly shows that it's possible for us to make progress on these achievement gaps even in a time of rising income inequality, but it really raises as many questions as it answers in that regard. That is, what is it about some places that showed more narrowing than other places? What can we provide in communities? What can we do to support families? What kind of preschool environments are going to be most successful for kids? We have a lot to learn yet about how to think to optimize opportunity for low-income students. How to close the achievement gap in our lifetime.